I'm preparing to put my Netherland Dwarf doe, Billie's, nesting box in her cage tonight. I believe she is pregnant but I really was not sure what to feel for when I palpated her around day 11 because this is my first time. It is now the 28th day and she's been very moody, refuses to let me pick her up, her hutch has grown quite a bit and when she lets me pet her I try to feel her stomach as much as I can. Her stomach is much rounder and firmer. A few times I've felt small pulses but I can't really be sure because she wont let me pick her up. Comments for Netherland dwarf pregnant? I have a Netherland doe that is pregnant with her first baby I felt her baby in her stomach put in a nest box with straw for her she never pull fur and she 36 days today and no baby. I think it because I keep watching her and she scary to give birth. Could be. Can you still feel the babies in her belly? If so, they will come, but the chance of problems does go up, the longer it takes. Always get a veterinarian opinion if you have questions. There is another thing - are you feeling the movements of the intestines and not the movements of a baby rabbit when you felt the rabbit's belly? If so, then she was of course not pregnant to start with. Try rebreeding her today. Perhaps she'll "take" this time. Thanks! This helped a lot.I have a question though-how do I know if my netherland dwarf doe is pregnant on the second day of being mated? Is it possible to tell? Thank you. No, as far as I know, not possible to tell. At some point a lab test might show elevated hormone levels. Otherwise, palpating at 10 days (8 days if you're really good at it) is your best way to ascertain pregnancy. My doe just got pregnant recently, and I was wondering, I should separate the male from the female right? 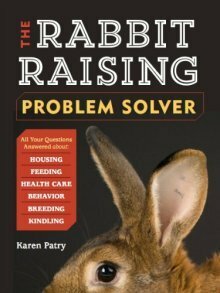 I don't want the male doing anything that will mess up the birth, or eat the bunnies, and in addition to that, WOULD the male eat and kill the baby bunnies when they're born!?!? P.S, if they make the nest, how far are they into the pregnancy? Bucks usually make great dads. We have no experience with leaving a buck in with a doe through an entire reproductive cycle, but in the wild, they do not cause harm to their kits. Yes, you should separate the buck from the doe, only because it will rebreed the doe as soon as given half a chance after the kits are born. The calendar is the best gauge of when the kits might be born -- 31-32 days after breeding. It is up to you to mark the calendar for day 28 (put in or prepare the nest), and day 31 (expect the bunnies to be born). Thank you! Usually my little bunnies live together in a hutch. Should I separate them for the births? And should I keep the litters separate from each other? If so, how long for? Its getting colder here at night, so I was thinking of bringing them inside (in separate carry boxes). I was also wondering- in your photo your bunny has a huge neck! Is this a pregnancy symptom? My little bunny has just developed one!!!!! It's hard for me to make the call as to leaving the does together or apart. If they're very best buds, it might be safe enough, but in the wild, the dominant doe will typically drive the other doe away or even kill her babies. If it were me, I'd probably not take chances. I'd give them their own living quarters for the duration of the pregnancy, birth and weaning. Once weaned, you can mix the litters together until they're 9 or 10 weeks old. At some point you'll see the dominant bucks getting testy with each other, and riding all the does. That's your clue to separate everyone. That "big neck"? That's called a dewlap, and it's a grown-up 'doe' thing. And yeah, they tend to be substantial on some of my rex does, heheh. The doe usually pulls fur from it when building her nest. I have the same problem - But I'm not sure my female Netherlands are pregnant. I mated them with a male Netherland nearly 3 weeks ago, and they hated him! I wasn't sure if he was successful, I only saw once the buck falling and stamping his foot. But now, my bunnies are super angry! She even bit me today when I went to pat her. I will put some hay in her hutch tonight to see what she will do with it. Thanks for your advice! Yeah, and by the sound of it, you better put a nest box in there next week!! Yep, I'd bet your doe is pregnant. I see you got some excellent remarks about how to palpate and look after your pregnant dwarf rabbit. Just so you know, palpation is most effective between days 10 (babies marble-sized) and 17 (grape-sized or a bit larger). You can feel the baby-lumps more easily. Your doe's moodiness is definitely a sign of pregnancy, as are the other signs you've described - being rounder and firmer. In our opinion, it's too late to handle your doe. She doesn't want any petting, and won't be offended if you just keep an eye on her and let her alone to kindle in peace. But next time, you could weigh her when you breed her, and then weigh her on, say, day 15 or day 21. A several-ounce weight gain in a Netherland Dwarf should be indicative of a positive pregnancy, most of the time. We use weight changes in our Rex rabbits to help us know if we palpated correctly. Sounds like you're doing a great job. Take heart - your doe's hormones are driving her right now. She'll settle down and be your friend again eventually. PS: Are you aware of the possible eventuality of dead "peanuts" in the nest box? If necessary, click on "The Dwarf Gene" in the Navigation Bar to learn more. First lay her flat in your grooming table, or a slab of carpet. Grab her by the ears and the nape of the neck (for dwarf breeds grab their head or nape of neck) and then, with your thumb and first finger, feel along the abdomen for any lumps. If your doe is 28 days into her pregnancy, her abdomen should be round and firm, and you should feel movement. Do not handle the doe as much when she is a few days away from giving birth, for you might stress her out and you may lose the litter. The gestation period of a rabbit, no matter what breed, is 31 days give or take a few. It is also good to desensitize your doe to touching her abdomen. Most does are very jumpy. About a week after you put her in with the buck, start desensitizing her to your touching her. Then, by the end of the second week, into the third week, feel for any lumps of life. by then your doe should not try to bite, scratch, or run away from you. I have a New Zealand doe that is a week into her pregnancy and I started desensitizing her to me touching her. Anyways, here's some rabbit info to keep in mind!